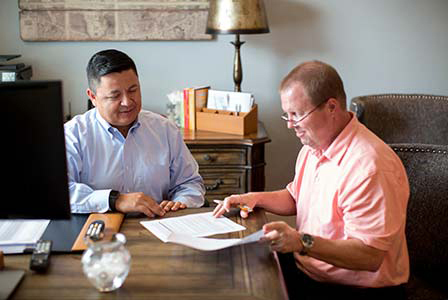 Learn more about the financial planning and retirement planning services we provide to our customers. A financial plan specific to you and your individual circumstances and needs will form the foundation for all aspects of your financial life and help guide our recommendations to help you reach your goals. Your plan will help you determine how much to save and invest in order to reach your financial goals.While your financial plan will ultimately guide you to retirement, as we live longer and change careers more often than previous generations, your plan must be dynamic and help guide you through life's inevitable twists and turns. Planning to raise and, of course, educate children may be a significant pre-retirement goal. We will develop an investment strategy to support your financial plan that is appropriate for your personal situation and goals. No matter your objective - whether long-term growth, downside protection for when the market declines, or the generation of regular income - we will help you structure and manage your portfolio for your unique needs. Structuring your investment portfolio in a tax-efficient manner, considering all your accounts, will be an important part of your investment strategy. The management of debt such as student loans, credit card debt or other personal debt may be an important part of your initial financial plan. Whether educating grandchildren or leaving a legacy at your favorite charity or institution, we will incorporate your wishes in your financial plan and help you design the best way to make your wishes possible - either during your lifetime or after. Life can surprise us with unexpected events such as illness, injury, job loss, death or natural disaster. We work with our clients to assess their risks and develop strategies to manage and mitigate those risks. For business owners, employee retirement and savings plans can play a key role in attracting and retaining quality employees. Look to us for advice on designing the right plan for your company.